Transporting your products from one place to another? Then our goods trolleys are the perfect storage solution for you. It comes in full height and half height with varying internal capacity depending on which one you need the most. Each trolley is made out of heavy-duty material which ensures safe transportation of items for a longer period of time. Both the full height and half height variety are easily collapsible which means you can quickly store them when they’re not in use. 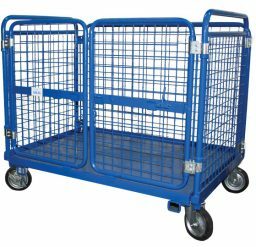 Both sizes of the goods trolley come fitted with 270 degree opening lockable gates. This means you can use your trolley for either a single shelf configuration or a two shelf configuration. 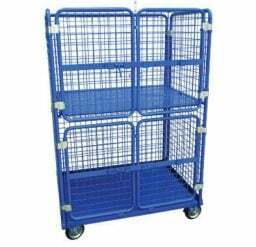 Each goods trolley has a powder coat finished which protects the unit for a long period. It also has 4 swivel heels with the 2 ones fitted with brakes for smooth and safe manoeuvring. Krosstech’s goods trolleys are durable, multifunctional, and safe to use.